A few weeks ago I attended the Australian Fitness Show in Sydney. I was excited as it has been years since the last time I had been. I was mainly there to support some of the most amazing men and women that I know, the people I train with everyday that are up before the sun to achieve their goals. I thought I would leave the day feeling inspired…… I was so wrong! As I made my way to the Powerlifting stage to support my team mates I had to fight my way to cross through lines of people all waiting to worship these muscle bound people standing around to take photos. I looked towards people doing amazing things in the CrossFit area……not many people were watching. I raced over to see people doing all kinds of amazing things on high bars…… not that many spectators either. What the hell? I actually started to feel sad at the state of the industry that should be celebrating the doers……. show me the training, the lifting, the people demonstrating their athleticism. I felt angry that more people just want to stare at semi naked bodies. 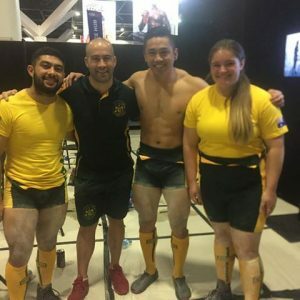 While my friends from National Strength and Performance Centre have trained for hours and are getting out their to SHOW people what they too can achieve when they find their passion and work hard. These are the people that have day jobs, families and multiple commitments in their lives while still aspiring to be the best athletes they can. We had a 15 year old girl Brea de Jonge break a Commonwealth Record yet no one asked to shake her hand and have a photo with her. I saw the incredible Liz Craven a 52 kg woman, squat 155.5 kg for a new World Record!! 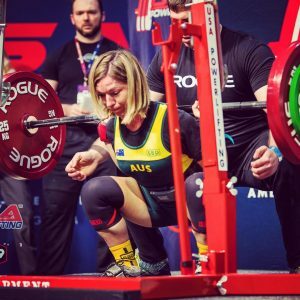 She is a mum from Canberra who juggles work, coaching, family commitments and being an elite athlete. I couldn’t walk away feeling in absolute awe of Kevin Gray who squatted 240kg – almost five times his own body weight – and more than 10 kilograms over the former record. These are the people that we need to seek inspiration from. The super coach Simon Bergner……not only competed as an athlete but worked tirelessly to ensure his athletes were 100% supported. They are not sponsored by any fancy brands, they do not receive any financial support for travelling…… they don’t even get a free massage every now and then. Welcome to the world of Powerlifting….. I absolutely love the sport and have only been involved for the past 12 months but it is not your glitz and glamer sort of pursuit. What it does involve is amazing support from fellow lifters, people to remind you not to give up. People that cheer you on through the trials and triumphs, reminding you that after every missed attempt you can achieve your goals. I love that we are all different…… no two athletes are the same. There are males and females of all ages, sizes, shapes and abilities that brave the platform to test what they can really do. It is not a sport focused on looks, makeup or what fancy clothing labels you wear. The pursuit of being able to conquer your fears and test yourself mentally and physically. Why are we looking to find role models in the people that photoshop their images and their six pack abs? The industry has become all about smoke and mirrors……I have nothing against body building but I want people to see the WORK that goes into it. I realise that no one gets a six pack without hard work and sacrifice but we only celebrate the end results. Why are we worshiping false idols? We should be marveling at their training and hard work NOT the result. Don’t believe the world of Photoshop…….follow the REAL people on Instagram no filters……. celebrate the hard work and demand that they are the ones getting help to achieve their goals. Support the people that are actively pursuing their goals!